Dedicated. Valued. And for a long time. Since 1985, in fact. 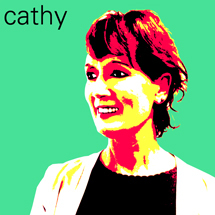 Cathy began at Witherspoon in a supporting role and eventually earned full watch and responsibility for all the accounting functions for the agency. She routinely receives praise from her coworkers, as well as from clients and vendors. Where would you like to spend your retirement? Out in the middle of nowhere. Why is advertising fun? It’s a different atmosphere than your average day-to-day job. If you could live in another time, when would that be? I like the here and now. What would you like to accomplish before you die? I’d love to see Rachael Ray in person. If your house caught fire, what would you rescue? My picture album. Up until now, what’s been your proudest moment? My kids’ accomplishments.